Small community values. Big time results. The Hythe Continuing Care Centre was honoured January 7 with a Rhapsody Rural Health-care Heroes Award which recognize rural Alberta health professionals or teams that demonstrate superior commitment to their patients, health-care team, and community. 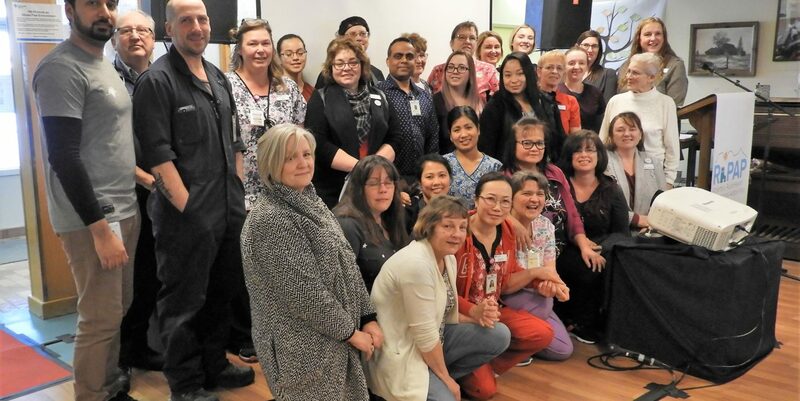 Members of the Hythe health-care team, centre residents, their families, and community members joined in the RhPAP-sponsored celebration at the Continuing Care Centre. The Hythe health-care team received numerous tributes during the event, including a video profile, and presentation of the newly established award by Bernard Anderson, Executive Director of the Rural Health Professionals Action Plan (RhPAP), and Dr. John Gillett, Grande Cache physician and RhPAP Board member. A donation was also provided to the Hythe Nursing Home Foundation y RhPAP in the name of the Hythe Continuing Care Centre team. Cheryl Klassen, Care Manager at the Hythe Continuing Care Centre, is thrilled with the honour. The Hythe Continuing Care Centre provides long-term residential care for people who can no longer live at home or in an assisted living centre. It was converted from a hospital in 1995 and accommodates 30 people. There is also one space for respite care. The facility employs a total of 77 staff. The Health Quality Council of Alberta (HQCA) regularly conducts surveys with families of residents in long-term care facilities across Alberta. In 2018, Hythe Continuing Care Centre had the highest Overall Rating Score in the North Zone at 9.3. The provincial average is 8.4. Hythe’s increase in rating score since the last survey in 2015 was the biggest increase in the province. Of the families responding to the survey, 100% would recommend this site to someone they care about. The food Rating Scale for the centre continues to move higher, scoring 78%. That’s 6 points higher than the provincial average of 72%. Barbara Hermanson, Chair of the Resident Family Council, which nominated the Continuing Care Centre for the award, is a retired nurse and knows what it’s like to work in a long-term care facility. She visits four times a week as her daughter, Heather is a resident.